Last week a box arrived at our door. I didn't know the name of the sender, and had no idea what it could be. Covered in stickers warning against tipping or tossing and not too heavy, I was curious. Inside were seedlings, a bag of tubers, some seeds, delicious looking candies, and a note. A woman I'd met at a harvest festival last fall had sent this box of green delights. We'd had a joyful, animated discussion full of laughter and confusion about plants, gardening, cooking, and everything in between. She'd generously given me some Jerusalem Artichoke to cook up, along with some treats from her hometown. (Most places, large and small, have a signature food or two that people often bring as a gift for friends old and new.) I'd liked her quite alot and hoped to see her at the next event as she lives rather far away. I felt so happy and lucky to have met her. 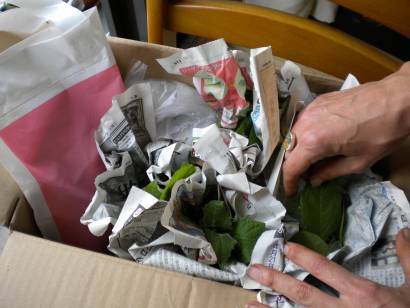 So here was this box with some very healthy looking seedlings carefully wrapped in newspaper and tied with string. Everything was labeled in Japanese and some English, so I still wasn't exactly sure what I was dealing with. Goya and fusen seeds were meant for a green curtain, which I was quite excited to see, although both are new to me. The seedlings and tubers, though, were a mystery. I guessed the tubers were yacon, but I had no idea about the seedlings. 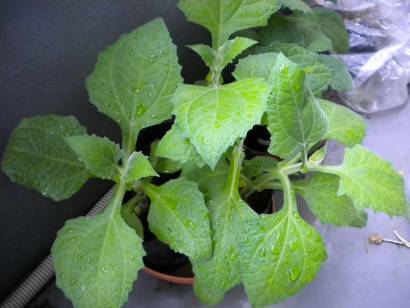 It turns out (after a little internet searching) that the tubers are Jerusalem Artichokes, and the seedlings are the yacon. Both grow quite tall (three meters or more), and require a fair amount of room. The seedlings are happy for the moment on the patio, and the tubers patiently wait in their bag. I need to do a bit more research before setting them in the ground. The seeds have been potted up, but are still sleeping in the greenhouse at the farm. I'm looking forward to adding them to the green curtain mix I've already got sprouting. That's fascinating that she just mailed it out of the blue after just meeting you. 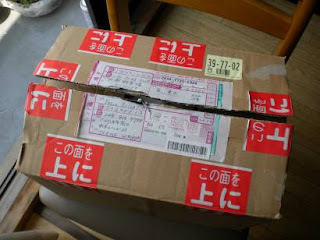 I'm not sure I would have opened such a package. I'm so paranoid. I would have thought it was a mail bomb or something. That would have been my loss, though! In many ways it's a very Japanese kind of gesture, Alisa. It's amazing! People here are incredibly kind, generous, and thoughtful even when they perhaps don't feel like it. It's quite striking, and makes for an incredibly harmonious and civilized society. Ok, it's not perfect, but it makes things better in so many way. Kenwooi, thanks for reading! What does your Dad grow? What a wonderful surprise!!!! I will look forward to the updates for sure. Thanks, Anjuli! I'm excited to see what will happen. I've got a couple things to transplant out of a big pot, and then we'll get to work. I'll keep you posted.